Is freelancing just a passing trend, or is it here to stay? Can you actually make a decent living doing it, or is it a dead end road? Can hiring a freelancer for your project be a good investment, or is it a waste of resources? Vague reassurances and promises aren’t enough. You want cold, hard data and reliable information before making an investment or changing the course of your career. Placing your confidence in anything less could lead to problems down the line. Not to worry – we got your back. By combing through the most recent reports and studies, we have pulled together a ton of information that proves freelancing is something that everyone should be taking seriously, whether you’re looking for work or looking to hire. But don’t take our word for it. Let the numbers speak for themselves. Let’s take a look at the available opportunities, the jobs that are the most popular or can provide the most work hours, and the skills you need if you want to win them. Within the United States alone, 35% of Americans freelanced in 2018. In just five years, this number grew 7%, from 53 million people to 56.7 million. In that same time span, the non-freelance workforce only grew by 2%, from 103 million people to 105.3 million. This growth is primarily being driven by younger generations, with 47% of working millennials currently freelancing – more than any other generation. And more millennials are beginning to freelance full-time, suggesting that is becoming more of a lifestyle choice than just a financial supplement. When Payoneer investigated where most freelancers look for work, what they found was interesting. Apparently, in recent years, most freelancers (73%) are turning to online marketplaces to locate clients. 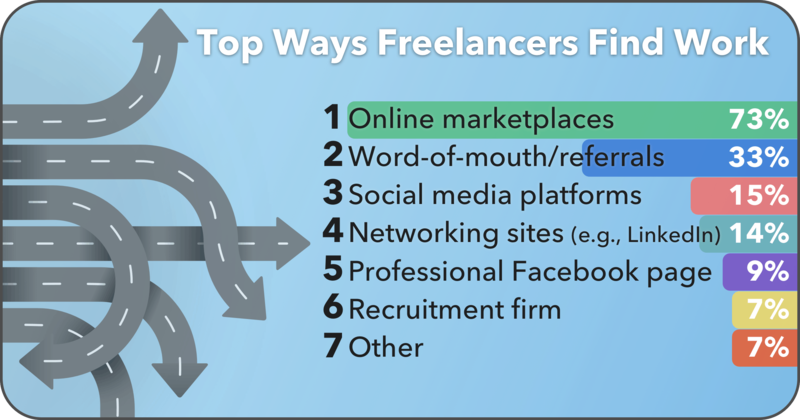 The second most common way, used by 33% of freelancers, is to find clients is through word-of-mouth or referrals. Other popular methods include social media channels and recruitment firms. If you are just starting out, it’s best to try a number of different venues to see what works for you. The largest freelance platform by number of users is Freelancer.com, with over 31 million. For more information, read our review of what it’s like to work on the platform. The second most populous, but largely considered number one by many freelancers, is Upwork, with more than 17 million registered users (12 million freelancers, five million clients). Curious about what it’s like to work as a freelancer on Upwork? Read our review. You can also learn about what it’s like to work on the third largest platform, Fiverr, by reading our review. Regardless of whether you are looking for work or looking to hire, freelancing platforms are definitely a strategy to consider. 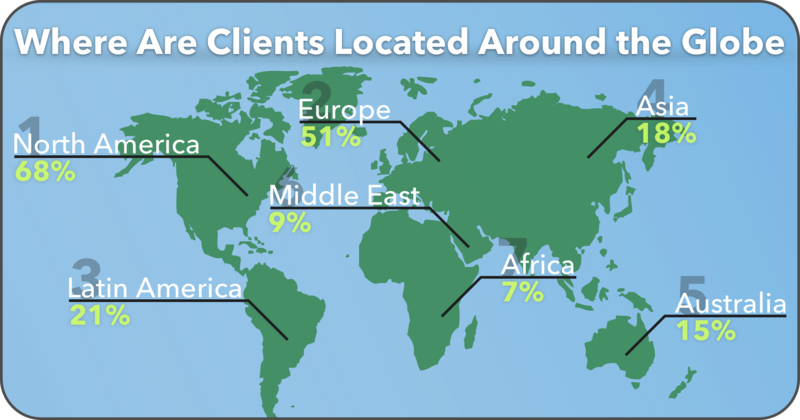 Payoneer recently asked freelancers where the clients they worked for were located. The majority of freelancers (68%) reported that they have clients in North America, while more than half (51%) have clients in Europe. The regions with the least amount of clients were Australia (15%), the Middle East (9%), and Africa (7%). Freelancing essentially eliminates geography as a barrier for work. However, freelancers should keep in mind that the level of pay they can expect to receive is often in line with the cost of living in the client’s country. The number of hours worked per week can vary greatly based on a freelancer’s area of expertise and the nature of the work (e.g., accountants are busiest over tax season). However, most freelancers work comparable hours to full-time, salaried employees. While many freelancers choose to work part-time, some positions require a full-time commitment. Positions that require the most hours include management (39 hours per week on average), as well as engineering, manufacturing, customer support, and administrative positions (38.2 hours). More freelancers than ever before are using the internet to identify and secure job opportunities. In 2018, 64% of freelancers used the internet to assist in locating clients, compared to only 42% in 2014. Thanks in large part to the use of freelance platforms and the ability to secure ongoing work, nearly half (47%) of freelancers said that they spend less than two hours each week looking for new projects. In fact, 67% of freelancers stated that the amount of work they found online increased in 2018, more than any previous year. A recent study went out to determine what skills freelancers are most interested in improving in order to advance their careers. Given the nature of the freelance economy, it’s not surprising that the highest percentage (33%) hoped to improve their computer skills. In second place, at 29%, freelancers believed that an improvement in their networking skills would have the greatest impact on their future opportunities. 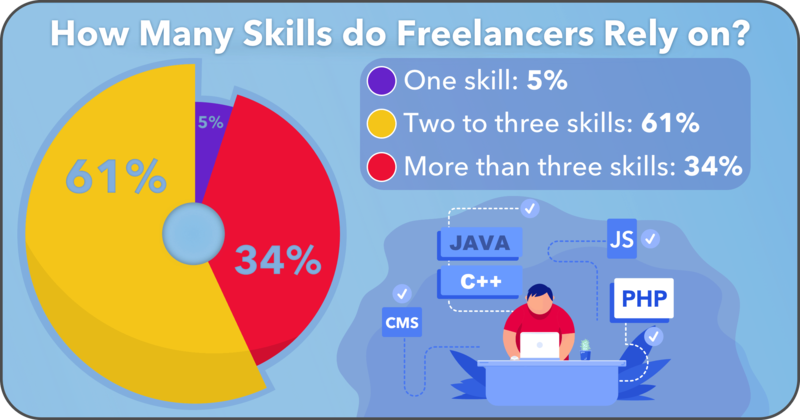 Other skills that freelancers were interested in improving included freelance business skills (27%), marketing skills (26%), and their ability to find work (24%). This points to needs that currently exist within the freelance community, which could be addressed through apps or training programs. 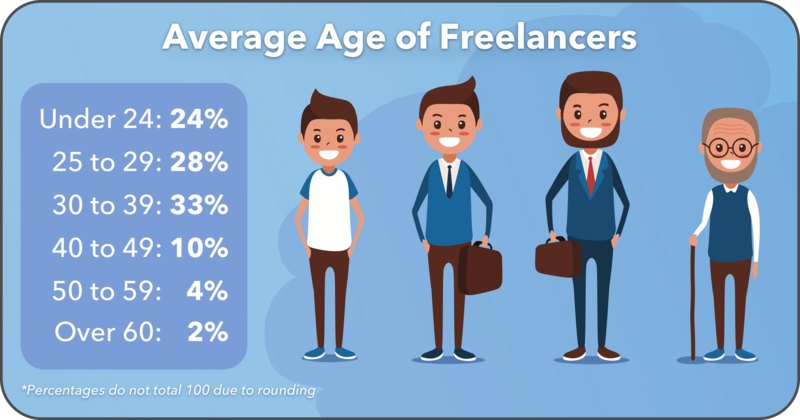 According to Upwork’s recent freelancing study, 54% of the workforce is concerned that the job they do today may not exist in 20 years—this includes both freelancers and non-freelancers. Freelancers, however, seem to have a higher level of awareness when it comes to how automation is going to impact the future workforce. More than half (55%) fear its impact on their future livelihood, compared to only 29% of non-freelancers. In addition, two-thirds (67%) of freelancers acknowledge that the job market has changed, compared to only 42% in 2014. This could have major implications regarding how individuals seek to secure work through either skill or client diversification. Of organizations around the world, 20% with a staff of more than 1,000 includes at least 30% remote workers. On top of this, 50% of organizations had a substantial increase in their freelance workforce within the last five years. In fact, up to 50% of jobs within the U.S. are compatible with remote work, and 80% of workers say that they’d like to work remotely on a part-time basis, at least. However, only 7% of businesses allow for employees to work remotely on any level. That said, there are quite a few large businesses that have begun to use a 100% remote staff. These include Edgar, Toptal, Basecamp, InVision, Ghost, Automattic, Zapier, Hubstaff, Trello, Buffer, Groove, Doist, and Toggl. This shows that businesses and individuals alike are becoming more comfortable with remote workers. When freelancers were asked what concerns them the most about going independent, their answers were fairly evenly spread. Access to affordable healthcare is the predominant concern, with 22% of freelancers sharing this problem. 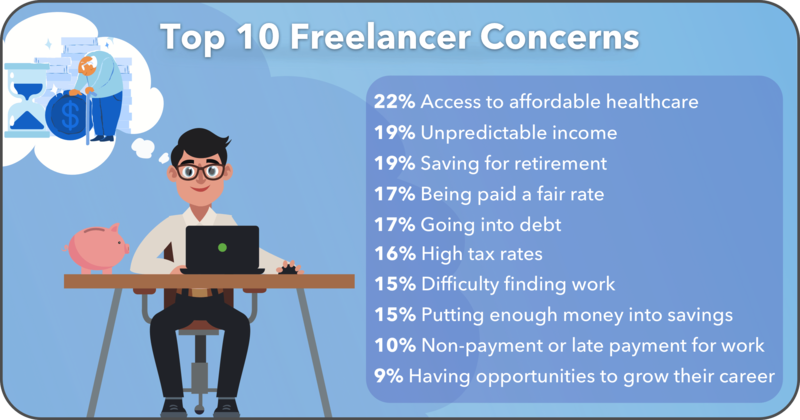 The two next largest issues faced by the respondents were unpredictable income and saving for retirement, both of which 19% of freelancers stated they were concerned about. Some other common problems faced by many freelancers are being paid a fair rate, high taxes, and the fear of going into debt. It’s important to note that many of these concerns could certainly be shared by full-time employees as well, and that there are only a few concerns listed that would be solely be felt by freelancers. The majority of freelancers all around the world skew young. More than half of all freelancers (52%) are under the age of 29 (and 88% are under 39! ), making millennials the predominant age group to pursue this type of work. Only 16% of freelancers are older than 40. This could be because freelancers often need to rely on new technology to be successful. It could also be because freelancers are less likely to have established professional and personal lives than older employees, and may desire more flexibility when it comes to their jobs. 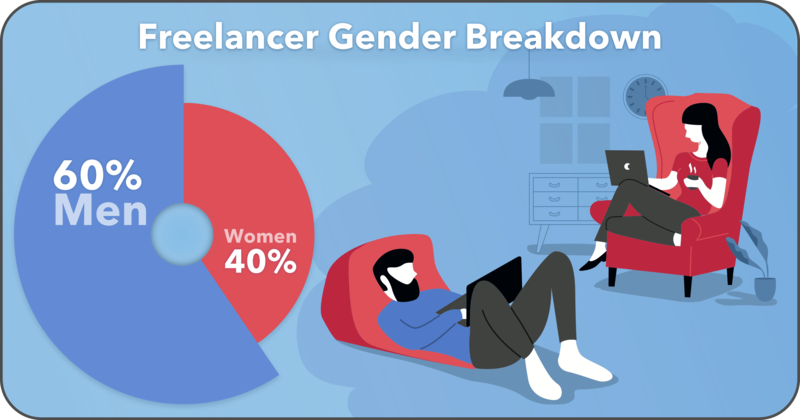 In the United States, 60% of freelancers identify as men (40% women). This is in stark contrast to global averages, where 77% of freelancers are men (23% women). A recent survey revealed that 86% of freelancers work from home during the week, an overwhelming majority. Coffee shops are also popular, as 40% of respondents said they typically spend at least some time working in these establishments. With the rise of digital nomads, more people are beginning to work abroad as well, with 25% working in a remote country or city. 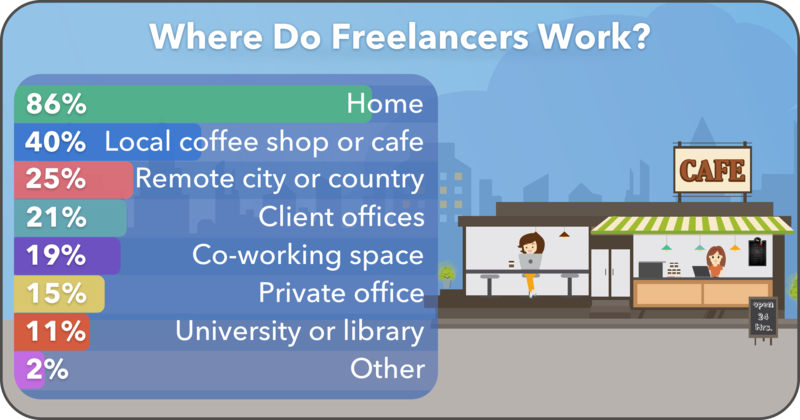 The ability to work from anywhere—including another country—is a major draw for many freelancers. In a 2018 study, freelancers were asked about their top reasons for choosing this lifestyle. A majority (81%) of full-time freelancers said it was so they could become their own boss. Flexibility and the freedom to work from the location they want were the next most popular answers. For part-time freelancers, the most popular reason (76%) was to be able to earn extra money. Whereas financial reasons appear to drive part-time freelancers, full-timers seem to be somewhat more focused around improved work-life balance. The majority of freelancers have multiple projects going at any single moment, while only 13% rely on a single project. A diversified client portfolio points to higher job security. The largest percentage (70%) have somewhere between two and four projects that they are working on concurrently, while only 17% take on any more than that. Half of all freelancers only do so intermittently (less than once a week), and likely have other, more traditional income sources in addition to their freelancing. The other half are consistent freelancers, and work regularly. In fact, 42% of all freelancers work less than once a week in this capacity, and often do so just to add to their income. However, the majority of freelancers (58%) do work at least once a week, suggesting the ability to get regular work regardless of whether or not it’s their only source of income. It appears as though freelancers tend to value skill training over formal education. 93% of freelancers with a four-year degree claimed that skill training was useful, while only 79% said their college education was still useful for what they’re currently doing. Of all global respondents, 54% of them held a bachelor’s degree, while 20% did not have any sort of degree. Freelancers are more regularly updating their skills in order to remain relevant in their given trade. When compared to traditional workers, 70% of full-time freelancers took part in some form of skill training within the last six months, and only 49% of full-time non-freelancers did the same. Most freelancers are enhancing their skills in the fields of networking, technology, and business management. One barrier they face when accessing quality training is cost, which affects 53% of freelancers. Who participates in political activities? Freelancers, in general, tend to be more politically active than non-freelancers: 53% of full-time freelancers participate in political activities, compared to only 34% of full-time employees holding traditional positions. 72% of freelancers said they’d be willing to cross party lines to vote for a candidate that supports freelancer interests. This indicates how strongly freelancers feel and suggests that they would be much more vocal when it comes to these issues. In a recent survey, 61% of freelancers claimed that they use two to three skills in their weekly work activities, while 34% rely on more than three. This shows that freelancers are effectively diversifying their skill sets and have opportunities across a range of project types. Only 5% of freelancers stated that their services were dependent on a single skill set. Now we’ll cover some statistics that better illustrate the far-reaching benefits of this rapidly growing economy. In the year 2017 alone, freelancers contributed $1.4 trillion to the U.S. economy. This is one of the major reasons why 67% believe that a booming freelance economy is beneficial to America’s middle class. With low barriers to entry and the ability to work as much or as little as you’d like, it’s no surprise that freelancing is making a difference to so many already. According to an Upwork study, 77% of full-time freelancers believe they have a better work-life balance since going independent. However, this does come at a cost, as 63% also claimed to feel anxious about everything that’s now necessary for them to manage. More than two-thirds (77%) said that they now have more time for the people and things they care about. A similar number of freelancers (76%) claim that their freelance work is more stimulating than their work in a traditional job, which is probably why many (51%) claim that no amount of money would be enough to get them to return to a traditional position. According to a recent study, 80% of freelancers reported an increase in morale, while 82% said that their stress levels had decreased. In another study, 68% of respondents claimed that their quality of life had improved since they began freelancing, while 23% said it’s about the same, and only 9% said that it had worsened. Keeping this in mind, it’s not surprising that many have indicated experiencing health benefits since going freelance—nearly two-thirds have indicated better sleep and overall improved health. A recent questionnaire asked freelancers, as well as those holding traditional positions, about their future career prospects. When asked if they thought their position offered upward mobility, 72% of freelancers said that it did, while only 53% of non-freelancers felt the same way. Freelancers were generally happier with their jobs’ rate of pay, challenge level, and long-term career paths. This may be due to the fact that freelancers feel like they have more control over the work that they are doing, and can negotiate rates on a project-by-project basis. 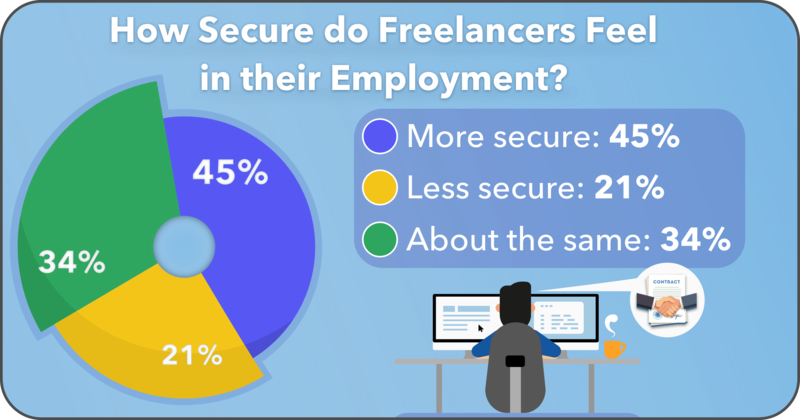 Of freelancers that were asked, 45% said they now feel more secure about their employment when compared to last year. This could be because they have had more experience working in the freelancing space, or because there are more opportunities available to them. 21% said they feel less secure, and 34% said they feel about the same. In the same study, 41% of respondents said that they intend to freelance for the foreseeable future. The majority of freelancers (63%) also believe that having a diversified portfolio of clients provides them with a greater level of security than a single employer (up by 10% since 2016). For this reason, most freelancers average 4.5 clients per month. In a recent survey, 42% of respondents said that freelancing has given them the ability to work when they were unable to hold a traditional position due to personal circumstances. This allows those with children, health problems, special needs, or other personal commitments to comfortably work from home, when other options may not be available. Freelancing can be incredibly lucrative for some, while others barely scrape by. 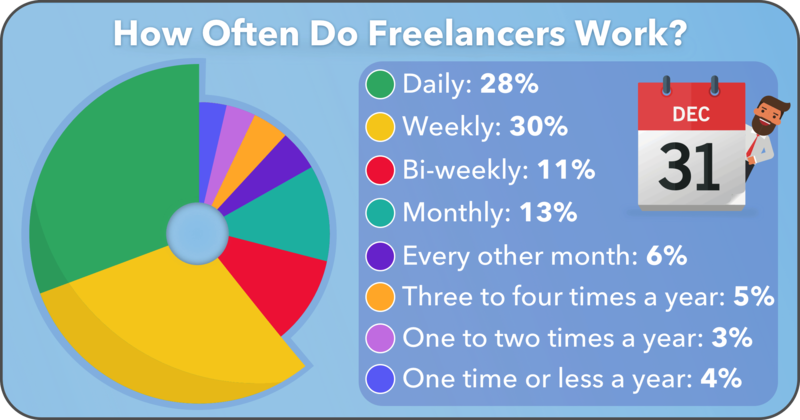 This depends on a number of factors, so knowing the statistics behind income for freelancers is useful for those looking to make more money, as well as for those hiring. When analyzed globally, it was determined that women in traditional jobs make only 54% of the amount that men make. And, while this disparity still exists in freelancing, it’s a bit smaller, with women making 80% of what men do across fields. However, in our own research of freelance platforms, we found the gender gap to be greater. The discrepancy varies depending on the industry. It’s the most pronounced in the IT and programming fields, where women’s hourly rates average 76% of men’s; and is the lowest in design and multimedia, where women earn 95% of the amount that men do. 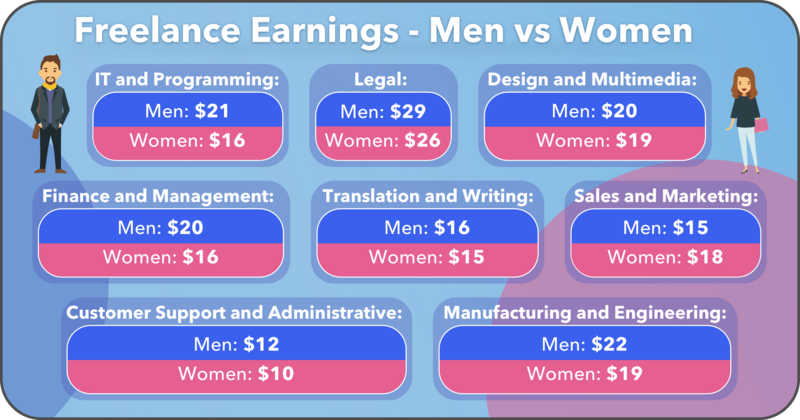 There are exceptions though, such as in countries like Romania, Mexico, and Venezuela, where there appears to be no freelance gender pay gap, and Bolivia and Indonesia, where women actually earn more than men. When analyzed by industry, the highest pay is earned by those in the legal field, specifically those practicing tax law, who earn $30 per hour on average. The field that has the lowest pay is customer support and administration, where freelancers earn a measly $11 per hour on average. 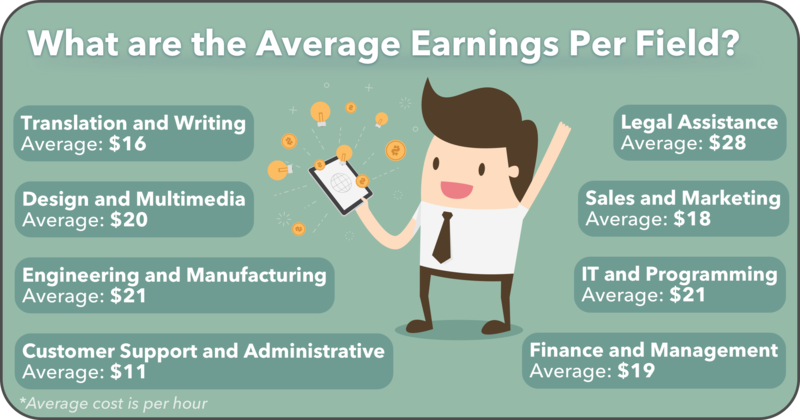 The industries that pay more generally require more in-depth or specific experience. For this reason, there tend to be fewer freelancers who offer these services, allowing those who do to charge greater rates. 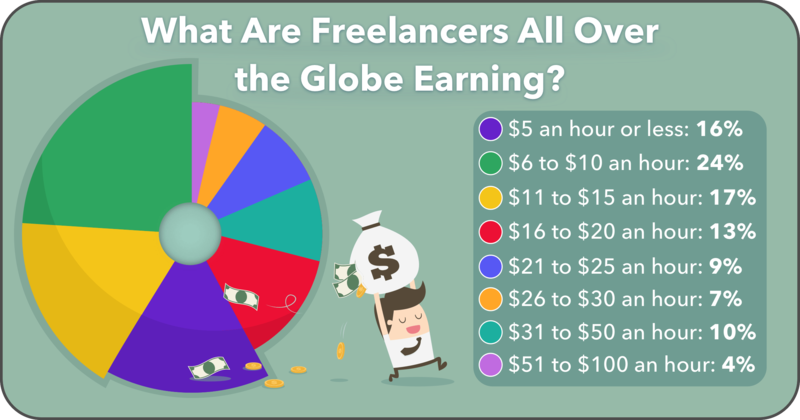 When analyzed by hourly rate, the majority of global freelancers (57%) make less than $15 per hour, and only 14% make more than $30 per hour. While this may seem a bit grim, these rates vary wildly depending on a number of factors, such as home country, native language, area of expertise, and experience level. Those with the right skills and experience are likely to make well over the global average, which currently stands at around $19 per hour. With U.S. freelancers, it appears that clients pay far closer attention to experience and ratings from past clients than they do education. This was determined by analyzing the average hourly rate of freelancers based upon their level of education. Therefore, those who are older and have more life experience, as well as those who have already earned positive feedback on a freelance platform, tend to enjoy higher pay rates. Full-time freelancers were asked how often they were forced to use their savings to make ends meet, and it appears they do so more often than non-freelancers. The data compiled showed that 63% of freelancers use their savings at least once a month, compared to only 20% of full-time traditionally employed people. However, it seems as though freelancers are aware of this trade-off. When asked why they went independent, only 7% of freelancers said it was for financial upsides, while most did so for personal growth or flexibility. One unfortunate aspect to freelancing that many have had to deal with is unreliable clients. 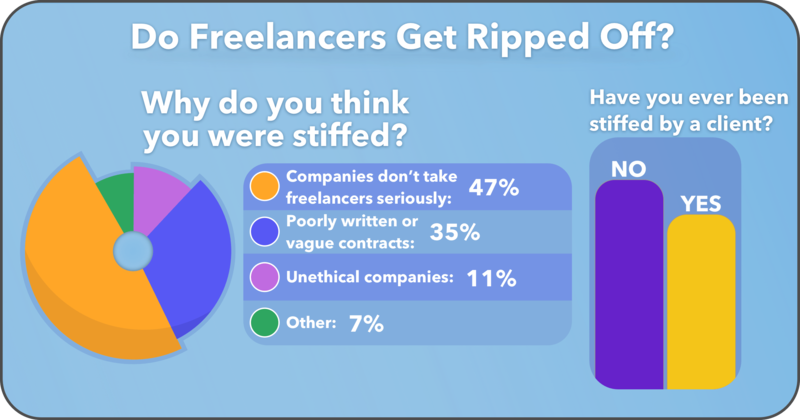 When asked if they’ve ever been stiffed by a client, a shocking 44% of freelancers admitted that they had, while 56% had not. Many (47%) believe that this is due to a lack of respect for the freelancer community, and 35% blame vague or poorly constructed contracts. This is a reason why it can be beneficial to work on a freelancing platform like Upwork or Freelancer.com, which have systems in place to ensure that contracts are upheld, offering arbitration services when needed. According to most experts, the future of freelancing looks bright. Here are some of the top projections regarding what’s ahead for this rapidly expanding economy. By the year 2027, freelancers are projected to make up the majority of the workforce within the United States, with 50.9% of the population. In fact, at the current growth rate, 43% of Americans are predicted to be freelancing by as early as 2020! This will have significant implications regarding how businesses are operated and projects are managed. Well, this just makes sense. If there are going to be more freelance workers, then there are going to be more businesses utilizing their service offerings. In fact, it’s projected that by the year 2020, a quarter of business’ workforces will be made up of around 30% remote workers. This equates to one out of five workers across the globe engaging in freelance work. Freelancers were recently asked what they thought was missing from the world of freelancing that they’d like to see more of in the future. 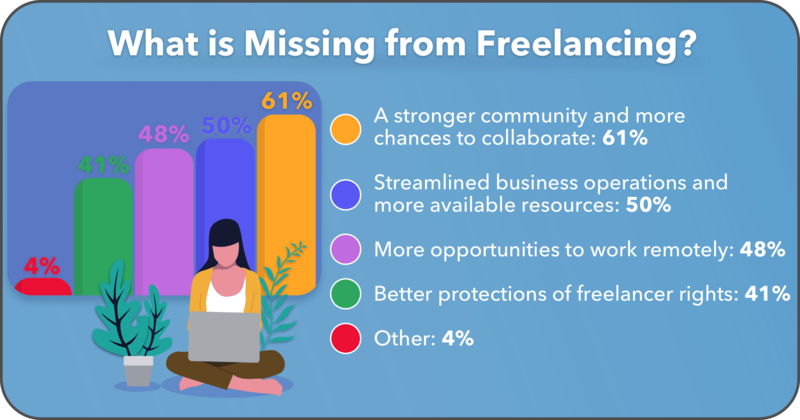 The majority, with 61%, seemed to think that freelancing lacks a strong community, and could benefit from improved collaboration. 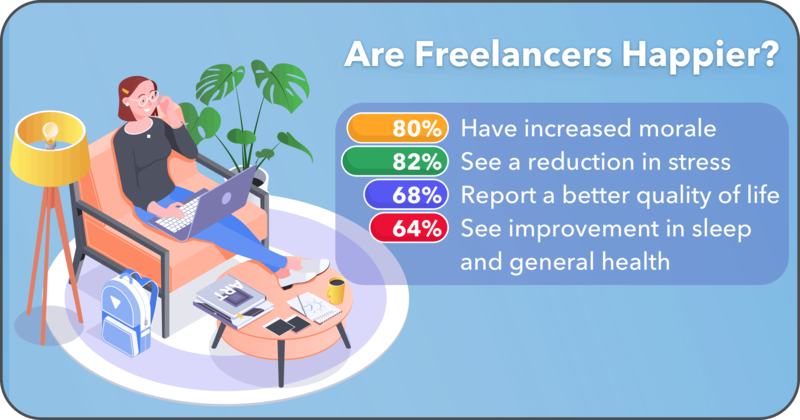 Respondents would also like to see more streamlined business operations, more remote work opportunities, and better protections for the rights of freelancers. It’s only a matter of time before these needs are answered by opportunistic companies, a number of apps have already become available to help freelancers and remote teams stay productive. A recent study analyzed freelancers’ attitudes toward globalization. According to the data, most freelancers (71%) view globalization as an opportunity for expansion, with the possibility for greater connection to potential clients and job opportunities. Answers could vary based on the types of services the freelancer offers, and how competitive his or her skills are. Hopefully by now you feel a little more enlightened about this rapidly growing way of life. As the data shows, freelancing is quickly evolving to become one of the primary sources of income for people across the globe. So whether you’re a client in need of good help, or a worker looking for an additional revenue stream, freelancing offers tremendous opportunity to countless industries.